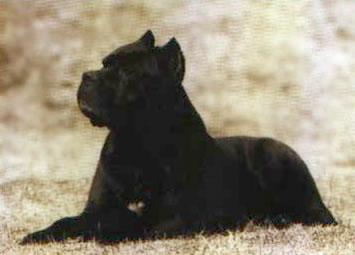 The Cane Corso history coincides extraordinarily with the history of the Italic community, in all its splendor and mystery. This breed was saved the last years of what seemed like a fatal decline, so there is currently a short record, but with a significant history and iconography, that has tried to reconstruct the origins of this breed. Lucannia, Pugglia and Sannia. His fierce and determined look, its imposing structure of all molosers own, seems to be in the order of their name. Corso means powerful, robust, strong, and these are undoubtedly its main features. Others attribute the etymological origin of the word to the Latin "cohorr" or major body guard, or Greek "Kortos" referring to the fact that he kept and watched people and animals during times of migration, but there are others who see the name related to the island of Corsica. I recently discovered the oldest documentation citing the name of the Cane Corso, and consisted of several poems written in verse and prose, dating from 1500. In 1998 the A.I.C.C. (Cane Corso Italian Association) published a study of race that brought to light: the military use of the Cane Corso, in 1137 in Monopoli di Sabina (near Rome), the discovery of breeding period, and close links between the race and Roman history. This allows us to consider the Cane Corso as primary evidence of an ancient race which has maintained particular characteristics over the centuries. This brings us long ago, the period in which the economy was primarily based on agriculture to the industrial revolution, but it should be noted that the great civilizations of the past, are also linked to the aesthetic appreciation of fans and breeders, as in the growth and decline of the Roman Empire, the Middle Ages and modern times. The Cane Corso has been maintained through the centuries by nature a close contact with the man, his environment and has participated in the roles which man has asked to play. We are talking about hard times when the success and survival of a race depended exclusively on the way to work, because in those times the reasons to grow and feed a dog were purely economic. It took on a responsibility that should correspond to the acquisition of a good or a service, they were times when nothing was permitted surface. The Cane Corso, we can admire it now, it is the best evidence of the theory that when a race exhibits certain morphological and behavioral characteristics related to work, consequently showing a race in its harmony and balance in your character. The past of the Cane Corso is not extensive, but current extraordinarily as if time had stopped. Something that strikes us is that outside Italy very little about the Cane Corso was known and that even in their home country, for years, the race has been forgotten and ignored. 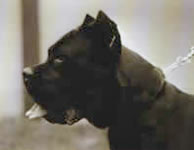 It took in 1973 Prof. Giovanni Bonatti was referring to the presence in the province of Puglia of a "short-haired dog mastiff, Neapolitan Mastiff different, similar to bullmastiff and like malloquín attack dog" for a group of enthusiastic be put to work and tried to recover and make it known inside and outside the country. In fact official recognition by the ENCI (Ente Nazionale Italiano di Cinofilia) only took place in January 1994, after the workbench Amatoria Societá Cane Corso (SACC) to provide adequate documentation, photos, data and large group of typical examples to defend their existence and ancient origin. The Corso has conserved from its ancestors the Epirus and Pugnases Moloso Oma, used in war and to fight, the nature of combat and the energy they have, are essential to successfully achieve your goal, without hesitation and with a potential force surprisingly, through contact with man in social situations, the Corso has learned to react only when necessary, becoming an excellent interpreter and gestures of man. Thanks to these features, the Cane Corso has survived until today. In small settlements in the south of Italy, held in an archaic system of agriculture in which a dog is doing multiple jobs essential companion. 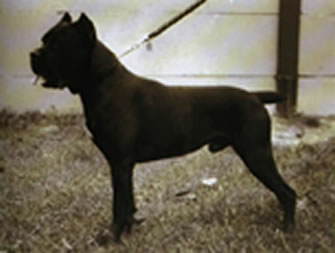 The modernization of agriculture and systems of breeding, in particular the disappearance of breeding wild and semi-wild, the disappearance of wild game and firearms with the consequent emergence of various techniques of hunting have reduced the traditional uses the Cane Corso. It is for this reason that the spread of the Corso has suffered drastic reduction since the Second World War. The situation in the early 1970s was worrying as stakeholders and only cared about the survival of the race that was reduced to a small number of individuals, and on the other hand, were not considered officially by the circles of fans and breeders, to despite the efforts of individuals such as Count Bonatti and Professor Ballotta. It took many years of work and a few personal commitments to once again discuss the cane corso breed so old and so deeply attached to the traditions and the history of southern Italy and has since recovered from practically nothing. There was, in fact, many contradictions about what truly resembled dog and locked in if the very essence of cane corso and it took many debates and discussions to be finally agreed on that issue should settle the foundations of new breeding lines. had introduced. In three exhibitions -Bari, Florence and Milan judges Morsiani, Perricone and Vandoni examined fifty copies, then in the fall of that year the SACC submitted to the ENCI the result of the first census conducted by Mr. Bruno and Indiveri in which collected data on a total of 57 copies perfectly typical and rustic already registered. As a result of all this effort ENCI enacted the opening of "Open Book" in which he could enroll all adult specimens were properly tattooed, and therefore recognized as complying with the standard in project and in just four years became part of it more than 500 dogs, so it was clear that the recovery program had been successful. These results gave rise to the recognition finally official breed in January 1994. His affable and loyal to his owns. Its extreme psychological balance and functional versatility allows it to adapt to everything you are doing to win more and more fans and actually used it again on grazing tasks and saves as before, and also in the hunt, but slowly earning a preferential position as a pet and what has been called pet therapy ("pettherapy"). However, for its size and extraordinary strength cane corso owner should be able to educate from the first moment to have it under control, so that never surprises or conflicts occur, puppy must learn from what is right and what no, what is forbidden and what is allowed, so that later there will be no setbacks, recommending is also a professional training certain circumstances, provided that the dog has acquired a certain degree of maturity, because we must not forget that, case of bulky, their psychological development is always slower than the physical. Conscious of its size and appearance, the Corsican not usually manifest nervousness and willingly accepts anyone who accepts his own master well. If called upon a property guardian balanced temperament can always do it from the background, with great discretion, and only in case of real necessity, acts and attacks. Thus we can conclude that the cane corso is an impressive animal, balanced and effective in any task required of him. It is a legend comes true.